Concrete line pump for sale is equipped with special pipes that can realize the continuous horizontal and vertical transportation. Moved by the tractor, it is lighter and more convenient to move, which is more suitable for rural and narrow zone construction. Because of its flexibility, it is more popular among our clients. 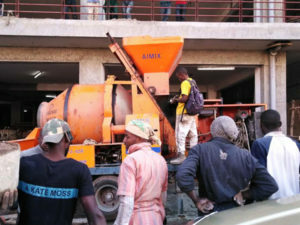 What’s more, it has the strong ability of pumping concrete vertically and horizontally. The concrete can be pumped to construction site through pipelines. Most clients are favor of it due to the advantages of safe construction, high efficiency, good quality, lower cost and less environment pollution. 1. The lubrication system adopts automatic multi-point lubrication technology. With one-to-one lubrication technology, the lubrication effect is better, which can effectively increase the service life of the easily worn parts. 2. The electrical system has characteristics of highly automated and reliable performance. The main electrical appliances are imported, which guarantees the smooth operation. 3. The self-developed and energy-saving control system makes the engine output power automatically match with the change of the load, and the fuel consumption can be reduced to the minimum. 4. The design of effective protection operation control system can ensure the system safer and more reliable. 5. 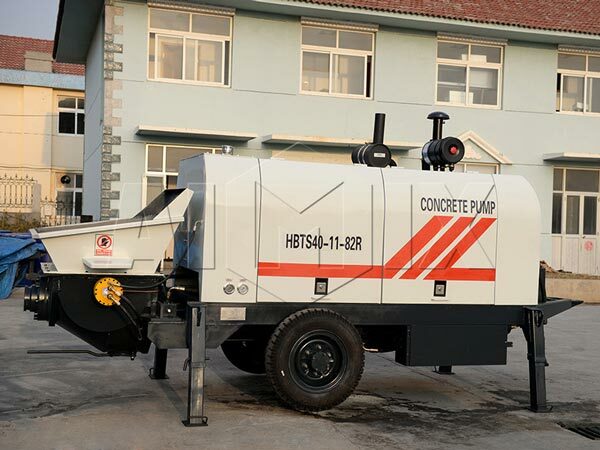 The hydraulic system of concrete line pump for sale adopts the full liquid control and transferring signal by the oil pressure makes the operation more simple and reliable, which improves the reversing speed of the swinging cylinder and reduce the impact of the commutation. The maintenance of engine thermostat in summer is very important. If the engine thermostat is removed blindly, because of the high temperature, the cooling system can only be used in a large period. Since the cooling intensity cannot be adjusted, it is difficult to ensure that the engine works at the right temperature. On the contrary, if the engine often works at low temperature, it will probably lead to the loss and wear of engine power and increase the fuel consumption. If the engine thermostat is repaired or replaced, and the engine temperature is high, the rest of the cooling system should be maintained. The thermostat cannot be removed blindly. In daily construction, some people think that the engine temperature can’t be high. In fact, low temperatures do a lot of damage to the engine. Concrete line pump should be used in a standardized manner within the normal temperature range to ensure the life of the engine. When the engine is idle, because of the low speed, the pump can not be used quickly, which will lead to low oil pressure. All moving parts in the engine work under dry or semi-dry friction conditions to atomize the fuel at low temperature, while the unburned fuel enters the crankcase and removes the oil film from the cylinder wall, which also accelerates the wear of the parts. So the engine should work quickly and improve the lubricating conditions of the engine. Before start the maintenance, you should know the internal structure of concrete line pump according to the following pictures. In the process of using and keeping line pump for sale, if you don’t maintain the machine on time, its technical performance will gradually deteriorate due to wear and tear, natural corrosion and aging, etc. So it is necessary to carry out maintenance and repair in time. The purpose of the maintenance of the line pump for sale is to restore the normal technical condition of the concrete line pumps, to maintain good performance and reliability, to increase the service life, to reduce the consumption of oil, which prevents accidents, ensures the safety of driving and operation and improves economic and social benefits. The steps are as follows. 1. Cleaning: Cleaning is the basis for improving maintenance quality, decreasing wear of machine parts and reducing oil consumption. You should ensure that the filters can work properly, and hydraulic oil is not polluted. There is no obstruction of the pipeline. 2. Checking: Checking is to determine whether the technical performance of each component is normal, whether it is reliable or not, whether there is any variation or damage to the parts of the machine through the methods of inspection, testing, etc. 3. Fastening: Due to the bumps, vibrations and hot expansion and cool contraction of the parts, the fastening of each component will change, even become loose, damaged and lost. Therefore, all fasteners must be complete and without damage. The installation is firm and the degree of fastening conforms to the requirements. 4. Adjusting: You should be familiar with the technical requirements of the adjustment, then according to the adjustment methods and steps, adjust the components carefully and conscientiously. 5. Lubricating: Lubrication is an important work to prolong the service life of concrete line pump, including engine, gear box, hydraulic cylinder, brake cylinder and transmission components. Choose Lubricant correctly according to different regions and seasons. The tool for filling oil should be clean, the oil nozzle should be wiped clean, and the injection quantity should be in accordance with the requirements. 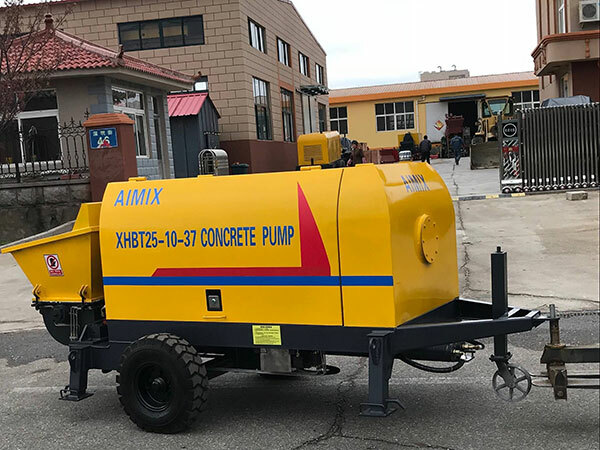 Our concrete line pump for sale was exported not only to Russia, but also to many countries, such as, Australia, Canada, Sydney, etc. Meanwhile, our products won good reputation because of their good performance. Our product not only have high quality, but also have reasonable price because all of our products are directly sold by factory. All kinds of machines can be customized according to the actual needs of users. If you want to buy a line pump, please send us an email and we will provide you high quality equipment and the best price. So please don’t hesitate to choose us!